Along for the ride, are a couple of stowaways. Angel, a young werewolf in search of adventure, and Kronus, an ancient dragon, seeking to regain the power his people once wielded. But when things don’t go entirely as planned, can the two overcome their differences and help each other find what they are looking for? 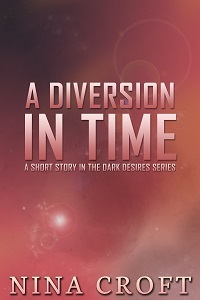 A DIVERSION IN TIME, is a short story set in the Dark Desires world and takes place just after book 6, Flying Through Fire. At this time it’s not for sale. You can get a copy by signing up for my newsletter or by dropping me a line through the contact form.